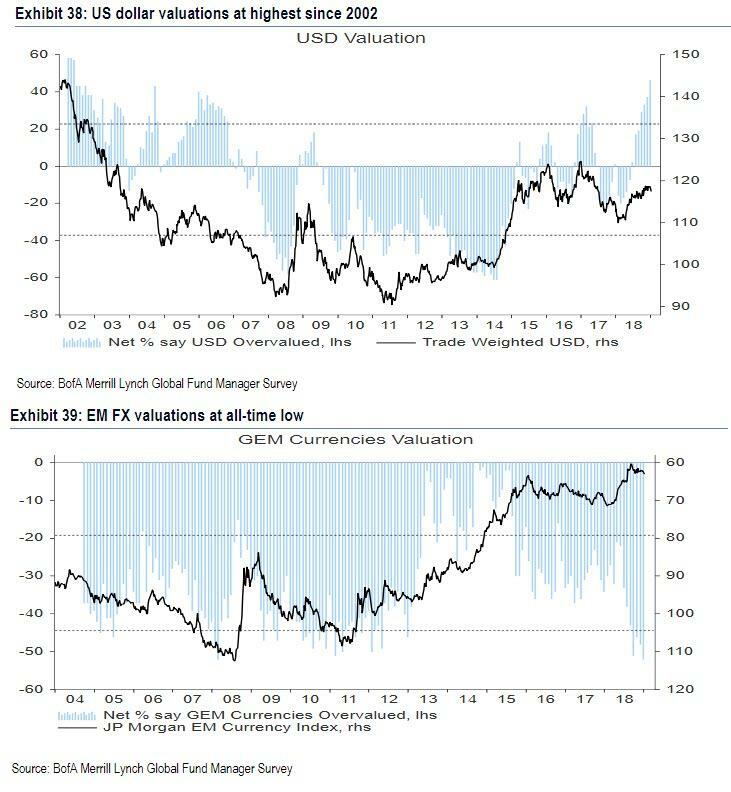 The latest BofA Fund Managers Survey, which took place between Jan 4-10 or just after the worst December for the S&P since the Great Depression, and polled a total of 234 panelists with $645bn AUM, investors’ expectations for global GDP growth continue to fall, as net 60% of those surveyed think global growth will weaken over the next 12 months, the worst outlook on the global economy since July 2008 and below the trough in Jan. 2001. 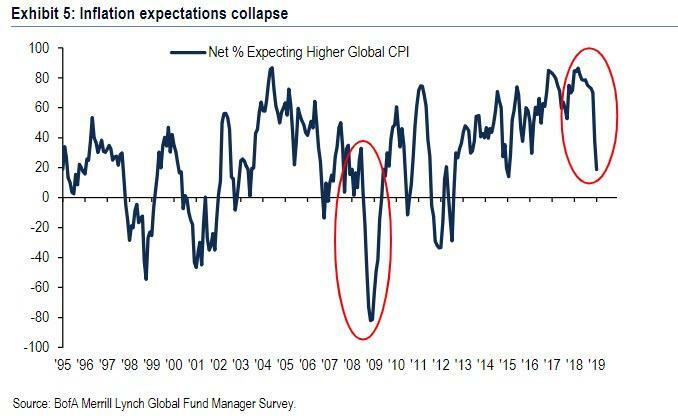 In fact, as BofA's Michael Hartnett observes, FMS Global macro expectations are "too low unless recession imminent", which of course means that all else equal, Wall Street is now certain that a recession is imminent. 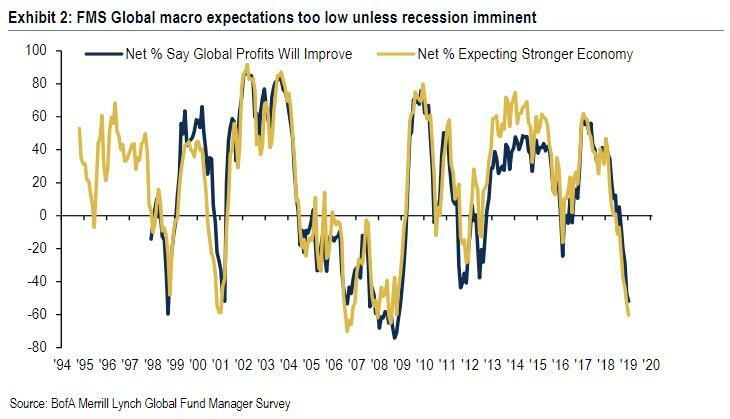 Which is also a paradox, because when asked differently, namely whether they expect a recession in 2019, only 14% said they do, so somehow Wall Street's best and brightest expect an economic and profit recession without actually expecting a, well, recession. Instead, America's investing professionals are calling for "secular stagnation" in the next 2-3 quarters rather than a recession. Why the latter and not the former? Because a recession would necessarily require stocks to drop far more than just the 20% bear market observed from the Sept highs, an outcome which the fund managers are far less willing to concede. In other words, while Wall Street is convinced a recession is imminent - if only for generic purposes that have nothing to do with their year end bonus - when it comes to their portfolios, nobody wants to admit what is about to take place. In line with the collapse in the economic growth outlook, January also saw another sharp drop in inflation expectations, which fell to net 19% of those surveyed expecting global CPI to rise over the next year; this was the second largest two-month collapse on record and a massive reversal from the recent peak of net 82% in April 2018. 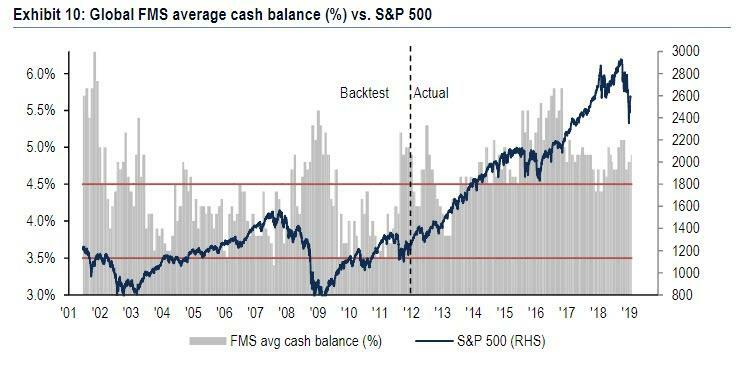 At the same time, the average cash balance according to survey respondents has ticked up slightly to 4.9%, up from 4.8% last month - which incidentally is barely above the 4.5% average of the past 10 years - while the BofAML Bull & Bear indicator has fallen from 2.2 to 2.1, just above the “buy” territory hit on Jan. 3. 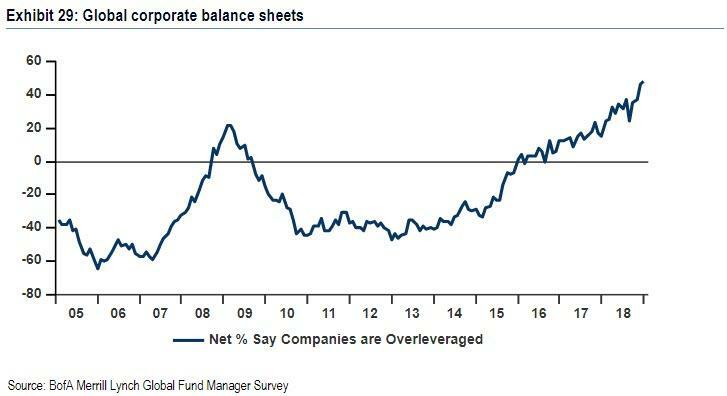 Besides the broader economy, investors concerns about the credit cycle also continue to climb, as net 48% of fund managers find corporate balance sheets to be overleveraged, in back to back months of record highs. 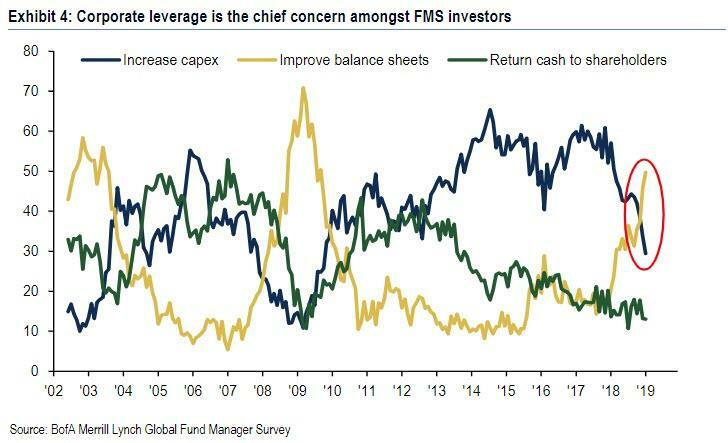 Of course, this is yet another example of cognitive dissonance, because while on one hand investors have never been more worried about leverage, on the other they just couldn't wait to start bidding up junk bonds and oversubscribing BBB-rated investment grade bonds. 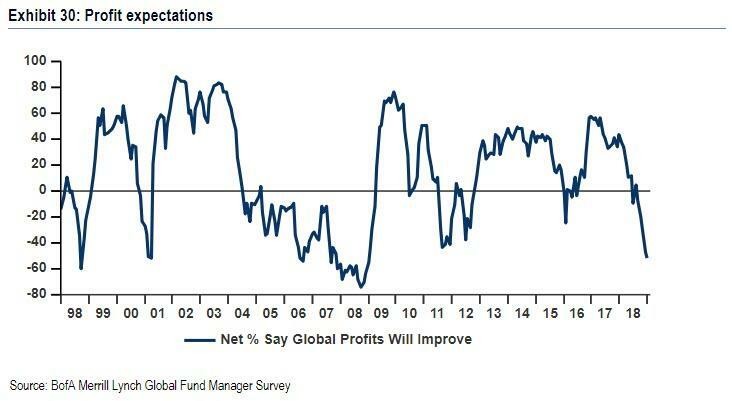 Meanwhile, even as 23 out of 24 Wall Street strategists expect the S&P to rise against in 2019, the January survey found - paradoxically - the worst outlook on profits since 2008, with net 52% of investors expecting global profits to deteriorate in the next year; this marks a major reversal from just 12 months ago when net 39% said profits would improve and, needless to say, is yet another example of the rampant cognitive dissonance prevalent on Wall Street where everyone wants higher stocks but at the same time wants to sound prudent and careful in perfectly meaningless surveys by saying they knew all along that profits are now facing a contraction. 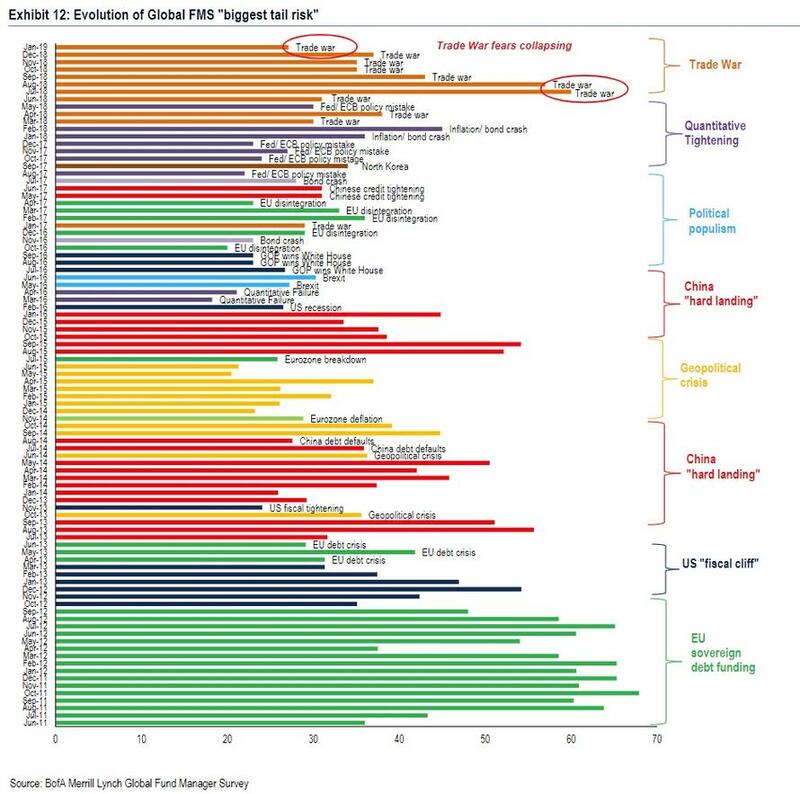 Finally, going back to everyone's two favorite charts from the FMS, the January issue found that a trade war tops the list of biggest tail risks cited by investors for the eighth straight month, with 27% most concerned about this "tail risk", followed by QT at 21% and tied with China Slowdown, also at 21% (our money is on China), though as the chart below shows, concerns have waned since summertime highs. While summarizing all these intellectual contradictions would be impossible, CIO Michael Hartnett gave it a try, saying that while “investors remain bearish, with growth and profit expectations plummeting this month"... "even so, their diagnosis is secular stagnation, not a recession, as fund managers are pricing in a dovish Fed and steeper yield curve." In other words: everyone is expecting the worst... and everyone is also expecting the Fed to step in and bail out their portfolios. 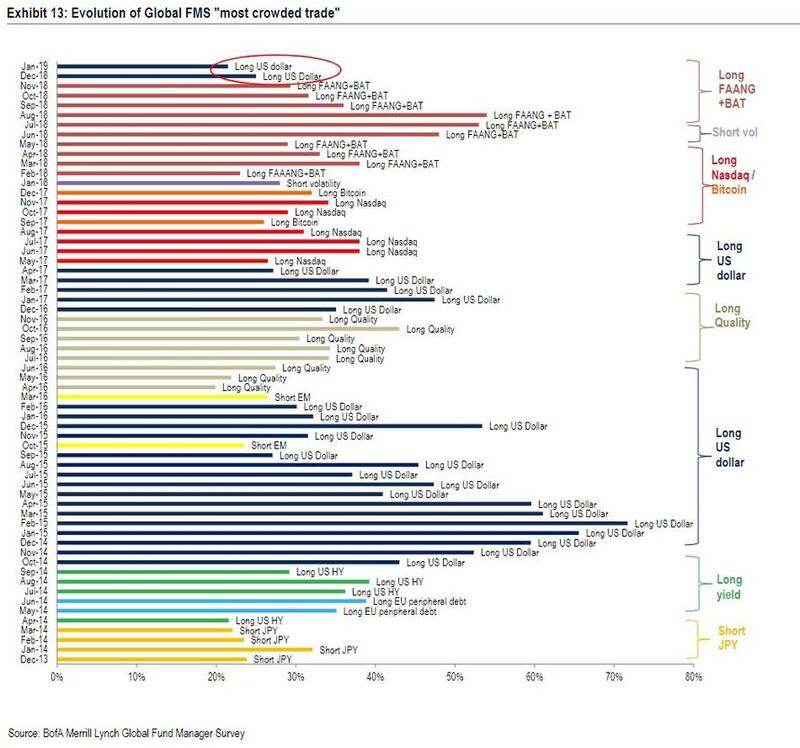 Which is of course why these fund managers are paid the big bucks.